Your protein boost for the day. And for everything else. Your body needs one thing above all else in the morning: Quick energy. Our organic soya-based Protein Porridge delivers complex carbohydrates and valuable plant proteins. Simply add warm milk or a milk alternative, wait 3 minutes and enjoy. Did you know that a warm breakfast makes you happy? No? Try it out. Double the amount of fibre. 3 x as much protein. Soy imported from Asia? No way. We always know where everything comes from. From certified organic seeds to the finished fine flake soy. Completely natural and without GMO or chemical additives. Everything from a single source – organic farm produce from Lake Constance. Our soy sprouts grow best in the nutritious soil and a mild climate in the border region between Austria and Germany. Patented production process. Rich in protein. Soya flakes are the main ingredient for our Protein Porridge. 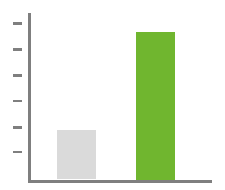 Thus, we create a product that not only has 3x more protein than ordinary porridge, but also half as much carbs. Perfect for weight loss and muscle building. It has not been scientifically proven that soya products upset the hormonal balance in men. But still - to be on the safe side, we reduce the probability of the original phytoestrogen content through our patented production process by an incredible 90 %. Therefore, we offer a delicious product with absolutely no drawbacks for men or women. 100% flavour you'll love. We use only the very best ingredients in our Protein Porridge. and natural flavourings. Weight loss without compromises. 3 preparation steps. 3 minutes. 2. Fill with hot water up to the line and stir. 3. Leave it for three minutes and enjoy. A varied and balanced diet and a healthy lifestyle are essential. May contain traces of: Gluten, eggprotein, soy, mik (incl. lactose). Shake tub well before use. Then mix 60 g (approx. 6 tablespoons) of porridge into 120 ml hot water, leave to steep for 3-5 minutes, stirring occasionally. 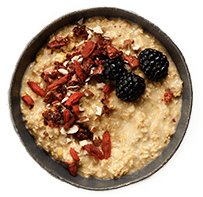 Our Protein Porridge tastes delicious with nuts or fruit. 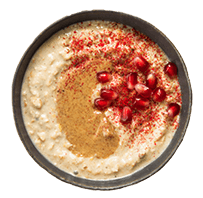 Use some goji berries or chia seeds to enrich your protein porridge if you need an extra energy boost in the morning. Disappointed by the taste of this product. I am a porridge lover.. i will not buy it anymore. Taste is not so good and the oats hard to chew. Not creamy like usual porridge, however it had good apple flavour (like apple pie almost) and did keep the hunger at bay all morning which was good. tastes better than expected. finally found the perfect porridge for me. It was worth it to try. Tastes good and so much protein per portion. not too sweet. fo r the perfect start in the day. Who should use protein porridge? Traditionally, porridge comes from Scotland and remains a typical workers breakfast for many families to this day. Porridge or oatmeal used to be mixed with either milk or water and enriched with cream - not exactly what we would call a healthy and valuable breakfast. 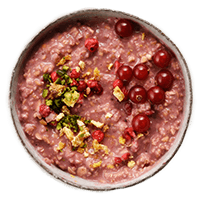 Today, the traditional porridge formula is complemented with another component: protein. This addition has brought it into the camp of functional foods. 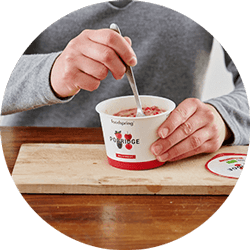 Organic Protein Porridge by foodspring is based on a protein concentrate sourced from German and Austrian-grown soya beans in organic quality. That comes exclusively from the organic farm Hofgut Storzeln. Hofgut Storzeln is located close to Lake Constance and was founded 632 years ago and has remained in the same family ever since. The beneficial micro climate around Lake Constance makes the region uniquely suitable for growing soya. The production and manufacturing process - from sowing to the end product - is closely monitored by the employees of Hofgut Storzeln to ensure compliance with the high quality requirements for organic certification in Germany. The processes of local farming to strict Bioland guidelines are at the heart of the high product quality of the soya cultivated at Hofgut Storzeln and in the Austrian Burgenland region. 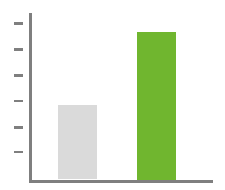 Bioland certification means foregoing factory farming, chemical fertilisers and pesticides. The special production process at Hofgut Storzeln ensures a particularly high protein content in our porridge. As an added bonus, the fat content is reduced by up to 80%. The low glycaemic index (low insulin response and constant blood sugar levels) of the soya flakes makes them an excellent helper in weight-loss diets as well. Men usually avoid soya because of its phytoestrogen content. Many are afraid that they might experience hormonal changes with the intake of soya. We are aware of these doubts and have worked with the people from Hofgut Storzeln and have come up with a great solution. The intelligent production processes of our Protein Porridge reduce the phytoestrogen content by up to 90%, just to be on the safe side. Our Protein Porridge comes from certified organic local cultivation. The high protein content or our Protein Porridge supplies the muscles with all the protein elements they need and ensures top physical performance. The addition of oatmeal flakes in the porridge provides a valuable source of complex carbohydrates. A sufficient supply of carbohydrates in the morning ensures an optimum energy supply for the whole day. Oatmeal flakes have a low glycaemic index and ensure a constantly low blood sugar level. A low blood sugar level is important for the burning of body fat in a weight-loss diet. Additionally, the mix of soy protein and delicately textured oatmeal flakes achieves a high fibre content for a long-term feeling of fullness. No more cravings in between meals! Our Protein Porridge also ensures the body is supplied with vitamins and minerals. Complex carbohydrates like oatmeal flakes are rich in potassium, zinc and magnesium, as well as vitamin B1 and vitamin E. These play an important role in a healthy immune system and ensure the transport of nutrients like proteins, carbohydrates and fats. 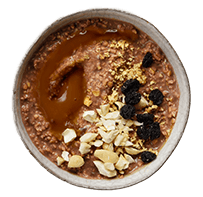 Our Protein Porridge is best used as a healthy, high-energy breakfast. The combination of high-quality proteins and complex carbohydrates supplies the body with all essential nutrients for a challenging day. As the porridge is available in a variety of different flavours, you can pick and choose just what you like. 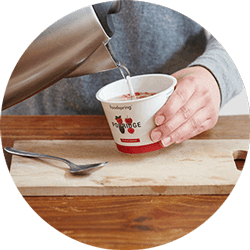 The 60 g cup is perfect for a quick snack on the go or during a break at work. Simply add 120 ml boiling water to the cup and let stand for 3 minutes. Stir it well and your Protein Porridge is ready to eat. 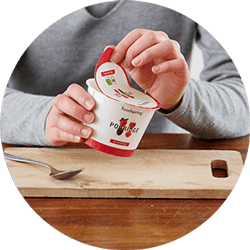 The natural version goes perfectly with fresh ingredients like fruits, nuts and yoghurt. This allows you to make porridge according entirely to your own taste. Breakfast is one of the central criteria for a successful weight-loss diet. Many people tend to skip breakfast to cut calories. More often than not this approach has negative effects: Skipping breakfast will give you energy deficiencies, which often manifest as food cravings throughout the day. Making sure you have a healthy and wholesome breakfast is a solid foundation for a productive day. The perfect choice for breakfast is a combination of high-quality protein and complex carbohydrates. Our Protein Porridge is exactly that. Your diet gets some meaningful support with a high-quality soya protein concentrate as your source of protein and oatmeal flakes for your complex carbohydrates. Eating complex carbohydrates is beneficial for a low blood sugar level and a low insulin response. These are the two key factors that will allow you to reduce body fat long-term. The high protein content enhances the feeling of fullness and provides your muscles with premium quality protein elements for muscle maintenance. Our Protein Porridge is suitable for anyone, who is looking for a satisfying start to the day and wants to give their muscles a part of their daily protein ration early on. Our Protein Porridge is also a great snack for in between times or a satisfying lunch at work. Many supermarkets now stock various porridges on their shelves. The instant-quality products on offer often have more drawbacks than benefits. They tent to contain lots of sugar and artificial flavourings, as well as colourants and preservatives. 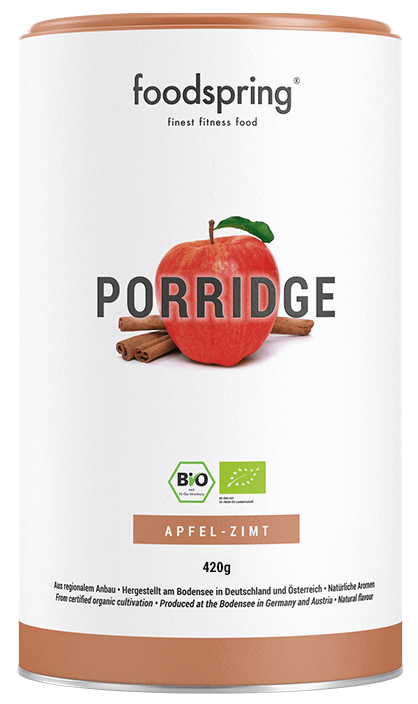 Organic Protein Porridge by foodspring is made exclusively from soya protein concentrate produced at Hofgut Storzeln in the Lake Constance region. The entire production and manufacturing process - from sowing to the finished product - takes place in Germany and Austria in accordance with strict Bioland standards. Bioland standards give consumers assurance on the following issues: No factory farming, no chemical fertilisers and no pesticides. The Bioland seal guarantees products with maximum purity subject to continuous quality control. Protein Porridge by foodspring is 100% organic and its natural formula is refined only with natural cane sugar and natural flavourings from certified organic cultivation. Does soya upset my hormone levels? Soya contains naturally occurring phytoestrogens. Contrary to popular belief, these are not hormones but phytochemicals that are similar in structure to estradiol 17ß, the natural female hormone oestrogen. It has not been proven beyond doubt whether or not the consumption of soya has an impact on hormone levels. For our Protein Porridge, we’ve taken the preventive measure of naturally processing our soya flakes to remove nearly 90% of the phytoestrogens. Where does the high level of protein come from? In a special production process, our freshly harvested soybeans get de-oiled. Simultaneously, we extract a large amount of carbohydrates. Due to that, we create soya protein flakes that increase the Protein Porridge’s protein content to more than 30%. Why is the Protein Porridge more expensive than ordinary porridge? Our production process is patented and we only use real and regional ingredients from organic farming. All these aspects create a product with unprecedented quality. 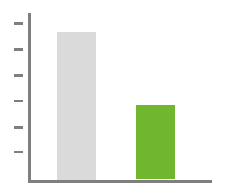 And that's not all: Less phytoestrogens and no chemicals. Why do you use soya from the Lake Constance region? Conventional soya is often produced in monoculture farming with the use of pesticides, which not only harm the environment, but also your body. That’s something we want to avoid. So when it comes to choosing raw ingredients, we demand maximum quality. We were very impressed by Hofgut Storzeln’s innovative production process and local soya production, which has led to a strong, reliable partnership with them. Do you use artificial flavourings in the porridge? No. We only use the very best natural ingredients and natural flavourings in our Protein Porridge and we offer two flavours: Apple & Cinnamon and Forest Fruit. Protein Porridge will be back in stock shortly.